The Car Works! 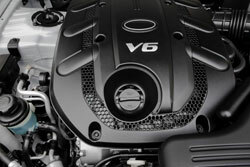 is proud to provide the Warren, RI area with the highest quality engine service and repair. The engine serves as a vehicle’s power source by converting energy into mechanical motion. All the other components within a car only distribute that energy. Thus, without its engine, a vehicle would be nothing more than a series of unanimated gears and joints encased in metal. An internal combustion engine generates energy through the combustion of a fuel, usually a fossil fuel. This process occurs with an oxidizer (usually air) within a combustion chamber. The result is that expanding gases push a piston downward and this movement is converted into a rotary motion by the crankshaft. Other components of the vehicle then direct this energy to the wheels. The entire process is synchronized by a timing belt and a timing chain, with an accessory drive belt assembly providing energy for systems like HVAC and steering. Many things can go wrong during the course of this process that can greatly affect the drivability and safety of your vehicle. If you’re experiencing any issues with your engine bring it in as soon as possible. The Car Works! has expert technicians and a service and repair center outfitted with state-of-the-art tools. A vehicle’s engine is composed of multiple pistons that move up and down rapidly, causing the engine to vibrate. Consequently, if the engine were bolted directly to the body of the car, it would make the entire vehicle shake and rattle. To fix this, rubber mounts that are filled with hydraulic fluid are installed between the vehicle frame and the engine to serve as a buffer. Because these mounts absorb most of the vibration, they become worn overtime and will eventually need to be replaced. Motor mount wear is very gradual, so gradual that most drivers won’t notice that it’s happened. Some symptoms to watch out for, however, include excessive engine movement when changing gears and vehicle vibration when the engine is idling. If you’re experiencing any of these issues, bring your car to The Car Works!. Our service and repair center, located in Warren, RI, comes fully equipped with the best tools and technicians to relieve all your engine troubles. The Car Works! is proud to provide the Warren, RI with the highest quality service at the best possible price! A vehicle’s engine is responsible for converting energy into mechanical motion. It accomplishes this through the combustion of fossil fuel with air, both of which are released into a combustion chamber by several valves. The resulting force of the expanding gases pushes a piston downward. Subsequently, the crankshaft coverts the downward movement into a rotary motion that is then distributed to other vehicle components. This process relies on precise timing and accuracy to be successful. The valves must release the air and fuel into the combustion chamber at the right moment and remain closed while the fuel is being compressed and the piston is being pushed downward. Lastly, an exhaust valve must open to allow the unwanted exhaust gases out. The process of opening and closing the valves is done by a rubber timing belt. At The Car Works!, we recommend that you replace your vehicle’s timing belt every 60,000 to 105,000 miles or according to manufacturer recommended intervals. They should also be replaced at the first signs of wear—a broken timing belt will not only make your vehicle inoperable, but it can cause serious damage to other components in the engine. Your timing belt will make an average of 30 million revolutions each year—make sure it makes another 30 million next year by coming to The Car Works!! In addition to an engine’s timing belt, it has an accessory belt assembly that is responsible for providing power to systems like power steering, the A/C compressor, the alternator, water pump, and radiator fan. Some vehicles come equipped with only one belt while others use several to drive different accessory components. These belts operate in a high heat and pressure environment and will become worn overtime. Older belts will crack as they wear while newer designs will develop wider grooves on their surface. If a belt brakes, the vehicle will most likely be inoperable—without an alternator running the battery will drain rapidly, steering will become difficult without the steering pump, and the vehicle will overheat quickly without the water pump turning. Another common problem in accessory belt systems is a defective tensioner. A belt tensioner is a device that applies tension to the belts to hold them in place on their pulleys. If weak or misaligned, the tensioner will not apply enough pressure on the belts, causing them to break or to exert insufficient amounts of power to run components like the alternator or water pump. At The Car Works!, we recommend that tensioners and belts be checked regularly and replaced at the first sign of wear. If you start to notice any of the symptoms mentioned above, or just want to stay on top of belt repairs, come to our service and repair center located in Warren, RI. Motor oil is a crucial component of the engine—it lubricates all moving parts, inhibits corrosion, cleans, and even cools the engine by minimizing friction. Without oil, all of the moving surfaces within the engine would come in contact with each other, generating friction. This friction wastes power by converting otherwise useful energy into heat and causes premature wear on internal engine components. Both the friction and the prematurely worn parts cause an increase in fuel consumption and a decrease in power output. Motor oil solves both of these problems by creating a separating film between contiguous moving parts within the engine. It also provides them with a protective layer against rust and corrosion. Overtime, however, the gaskets and seals that contain the oil can begin to leak— these leaks can be slow, but they can also cause serious damage to your vehicle’s engine. If your vehicle is experiencing an oil leak, bring it in as soon as possible. At The Car Works!, we guarantee fast and honest answers to all of your engine problems. You can rest assured that you will get the best service in the Warren, RI Area when you come to The Car Works!! Motor oil is the life-blood of your engine—it lubricates all moving parts, inhibits corrosion, cleans, and even cools the engine by minimizing friction. Without it engine components would grind together causing premature wear and eventual engine failure. Overtime, the oil will become contaminated by dirt, metallic shavings, moisture, and even anti-freeze. When this happens, sludge forms that restricts the flow of oil to the engine’s parts. In order to prevent sludge and moisture build-up, oil changes should be performed regularly. At The Car Works!, we recommend you have your vehicle’s oil changed every 3,000 miles or 3 months, unless otherwise specified in the owner’s manual. Make sure to use the oil recommended by your vehicle’s manufacturer in order to ensure maximum engine protection. Don’t know how to change your oil? No problem! The Car Works! has expert technicians and a state of the art service center ready to do it for you. Come by our service and repair center, located in Warren, RI, today for your oil change!